Bargains :: Tactical Works, Inc. Check here often for new Bargain items! The CCS Ring by Section8tactical is designed to accept Cord, Clip, and Strap mounting hardware for an easy way to secure a tactical flashlight to your gear. 2 included per pack. 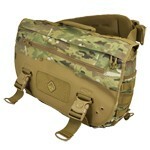 This is a diagonal-pack-type messenger-bag version of Hazard 4's Defense Courier™ bag. The feature-set is almost identical, but this bag has a thick, air-mesh backed strap with a modular MOLLE front so it can be worn more like a pack. This makes it very comfortable for long excursions with heavy loads, and it can still be rotated to a side-bag or chest-pack orientation for quick access to gear. It can also be outfitted with a stabilizer strap, and the main opening is modified to help retain contents in a sideways orientation. This LSS Chassis fits the Remington 700 Long Action. This LSS Chassis fits the Remington 700 Short Action.